Miche from Michel Suas' "Advanced Bread and Pastry"
I have made miches from Peter Reinhart's BBA, from Daniel Leader's “Local Breads” and the Miche, “Pointe-à-Callière” from Jeffrey Hamelman's “Bread.” All were good breads. Reinhart's was the closest to the Pain Poilâne I remember from my single tasting in Paris some 25 years ago. This weekend, I baked the miche from Michel Suas' “Advanced Bread and Pastry” for the first time. Suas references Pain Poilâne as the best known miche, but he does not say his formula is an attempt to replicate it. His “miche” is a 2 lb boule. This is smaller than my notion of a miche, but what do I know? I'll ask M. Suas the week after next when I'm at the SFBI for the Artisan II class and report back. 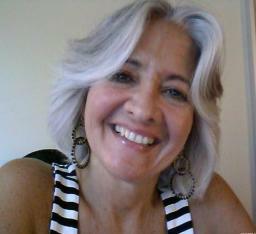 Suas' formula and procedures are quite unusual in several respects. It uses 3 builds and specifies a mixture of high-extraction, bread and medium rye flours. The final dough has 50% pre-fermented flour from the levain, and almost all the water comes from the 120% hydration levain. Even more remarkable is the very brief bulk fermentation of 15 minutes. I assume this works because of the very high percentage of pre-fermented flour. After shaping, the miche is retarded overnight before baking. Ferment 16 hrs at room temperature. Ferment 8 hours at room temperature. Note on ingredients: I used "Organic Type 85" flour from Central Milling for the high-extraction flour, KAF Bread Flour and KAF Medium Rye flour. Transfer to a lightly oiled bowl and ferment for 15 minutes. Pre-shape the dough into a light ball and rest it for 20-30 minutes. 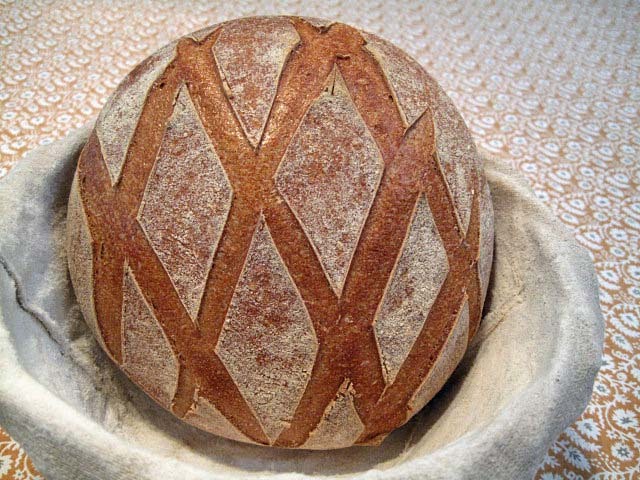 Shape into a boule. Place it in a banneton and cover well with plastic or place in a food grade plastic bag. The next morning, pre-heat your oven to 500ºF with baking stone and steaming apparatus in place. Transfer to a cooling rack and cool thoroughly before slicing. Suas doesn't mention it, but most authors recommend waiting 12 to 24 hours before slicing this type of bread. I sliced and tasted the bread after it had cooled for about 4 hours. The crust was crunchy. The crumb was chewy. The aroma and flavor were unlike any bread I've ever tasted. It did have a mild sourdough tang, but the flavor was uniquely wonderful. It had some nuttiness I associate with wheat germ and sweetness I've only tasted before in some baguettes that have had a long, slow fermentation or were made with pâte fermentée. I assume the wonderful flavor can be credited to the combination of the "Type 85" flour and the unusual process commented on above. I'm looking forward to baking some other miches using this flour. It's wonderful. Just a great looking loaf David. The combo cooker is the perfect size for a 2 pound loaf. You know, I think the combo cooker could handle a 3 lb or even a 3 1/2 lb loaf. There was lots of room around the edges of this Miche both when loaded and after it was baked. I'm inclined to give it a try with a larger loaf. That's a beautiful boule, David. What a pretty looking miche! You've done some really precise scoring on a perfectly proofed loaf. The results are oustanding! Can't wait to see the crumb shots. I was pleased with how the scoring turned out. Thanks for the compliment! Hello David, What an absolutely beautiful loaf you've made. I love the perfect, diamond scoring. SFBI should put you on the faculty! I like the large diamonds. Is that rice flour on the raised surfaces? 50/50 mix of AP and rice flour in the banneton. I tried this formula before, using the beer barm starter. Really liked the taste of that loaf, wasn't sure wether it was from the beer barm starter, or the process itself, will have to make it again using regular starter. I've never made a true barm, so I can't comment on the flavor impact. I've made other miches using other flours, and I'm pretty sure the special flavor I got with this bread can be credited to the particular high-extraction flour I used. However, I plan on testing this by making some other breads with this flour. 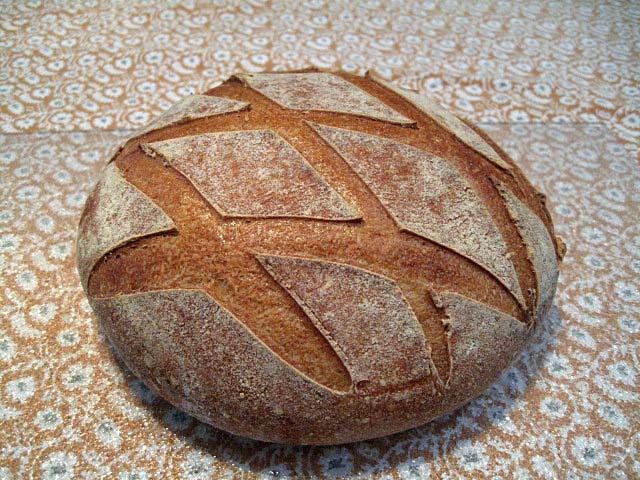 I'm thinking of the miche from BBA and the Miche, pointe-a-calliere from "Bread." I want to hang it up for Holiday decoration, but I know it would be eaten right away! Looks and sounds delicious! I believe a miche is anything from 2 lbs. up...a nice big round loaf, but what is it called if it's not round and weighs over, say 6 lbs. Hope you ask TSBI instructors! Though smaller loaves would be better suited for the two at my home. I usually bake 2 lb loaves. I just like a good size loaf of bread. The CC seems just right in circumferance but I'm sure about larger loves with a lot of oven spring...I've had very light loaves press against my lacloche and it has a very high ceiling. Magnifique!! I wiche I had been there. Now I can't wait to try the Central Milling Type 85. 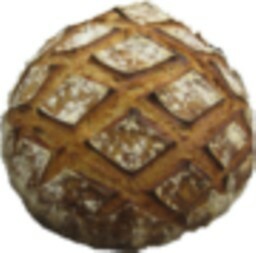 Try the Miche from BBA with the Organic Type 85. It should be wonderful. Not to be miched! My BBA Miche is cooling! My miche seemed to perform well, and it looks and smells wonderful. Blog post to follow. Thanks. Truly wonderful; would that authentic high extraction milled flour was easier to find! loved the pattern on the surface.... truly beautiful! Especially the decorative scoring. Just a lovely loaf to look at. My few attempts haven't had the nice crumb profile you managed. Great-looking miche, David - that scoring is sensational. Looking through your process, do I have it right that essentially there's no bulk proof before the shaping - only a final proof overnight, following which you bake it straight out of the fridge? Suas specifies a 15 minute bulk fermentation before shaping. He doesn't say a thing about proofing after retardation. I didn't follow his procedure exactly. See my notes. I've settled on a process that works well and suits my baking timeframe, and I now apply it to all my breads regardless of dough composition or recipe directions. ie: mix, autolyse, add salt and bulk proof 2 hours+ depending on ambient temp and dough appearance with hourly S&Fs, shape and retard overnight. Bake straight out of fridge next morning. I'm keen to try this one, because I've been thinking for some time of varying my usual process to see what sort of difference it would make to the finished product. This recipe as you've described it is quite different from any Ive tried before, so I figure it's a good one to try, especially in light of your very favourable comments on the flavour. Just one more quick question, if I may. When you do the poke test, do you watch for the dough to slowly spring all the way back so there is no indentation at all, or is some indentation permissable? I ask, because I have just had reason to deviate from my usual procedure, and ended up with a slightly underproofed loaf. I did a half-hearted poke test, but was overconfident and ignored the fact that it didn't spring all the way back. I'm guessing I should have waited until I could poke it and have it spring gradually back to erase all trace of an indentation, but am not 100% on this. Hence my question. The more advanced the proofing, the less the poked dough springs back. I generally bake when the dough no longer springs back completely, but this criterion does not apply to high-hydration doughs as well. They tend to spring back less. Yes, that makes sense with high hydration doughs. Going by my experience yesterday, then, the poke test is only an approximate indication of when a dough is properly proofed - or perhaps the fault lay with the interpreter. I guess you've got to try it out over time on different doughs to get a real feel for when the test says go and when whoa. Wow! Another "Masterpiece" . I bookmarked your post on my "long list" of Breads that I must learn how to make! I have some questions: What does DDT means? Also "High-Extraction" flour? What is it and what do you use? Medium Rye flour? I am sorry but I am still trying hard to learn the mystery of bread baking! I am using the advices I read on the post to "try and try " again on the same bread until I can really do it well .I am proud to say that I had mastered some of it now. DDT is "desired dough temperature." High extraction flour means that some but not all of the bran and wheat germ is removed from the flour. (In reality, it is removed and some is put back.) I used "Organic Type 85 unbromated" flour from Central Milling. Ricky Giusto told Glenn this is close to the flour Lionel Poilâne used in his Miches. Medium rye flour is whole grain rye milled to medium consistency - less coarse than pumpernickel, more fine than "fine." Can KA Sir Lancelot Flour be used for the High Extraction Flour? Probably not, but that is what I have and cannot find high extraction flour locally. Thank you for that beautiful miche, David. What a wonderful bread, fashioned with such precision. And thank you for sharing your SFBI class experience with those of us who haven't had the pleasure. I have enjoyed baking with the Central Milling high extraction type 85 as well. The Giusto folks are wonderful and generous. 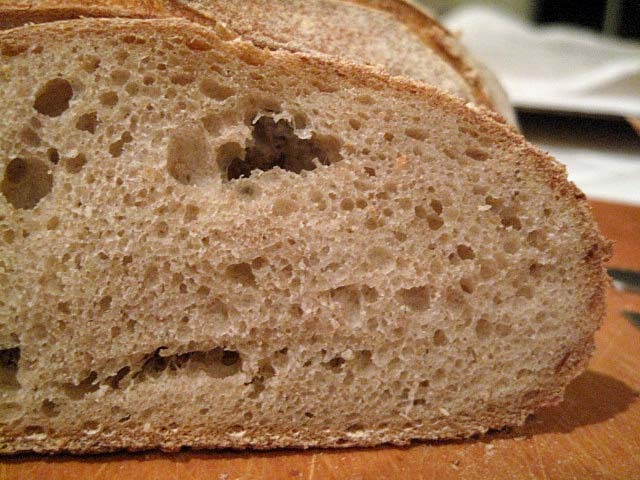 High-gluten flour is not the same. Rather, use sifted WW or a mix of WW and bread flours. Thanks so much for the quick reply. Love how the Miche came out. In as much as I love my village, it is impossible to get "exotic" flours , pastry, or any fresh seafood. I love Penetone and was able to get one early in Nov. at Sam's werehouse in Roanoke. Now, there are none anywhere. As a native Thai whose home is on the Tropical Island I am forever miss my fresh seafoods ,fruits and vegetables.sigh! Now that I am addicted to Penetone, other fine Western pastries and unable to get it here, I got to learn how to make Penetone and others, sigh! I find myself stumbling on your posts quite often. a great looking and I'm sure great tasting bread. We've become fixated on miche since one of local artisan bakeries has started supplying to local markets. It's probably the huge Tom Cat in LIC or some other, but the bread reminds me so much of what I had in Europe in neighborhood shops. Especially the old city of Bilbao. even though this is a rather old thread, perhaps you're still subscribed? You baked in a Lodge combo. Therefore I assume you had no "steam apparatus"? What is the "sift method" for DIY high extraction? This bread was not baked in a Dutch oven. It was baked on a preheated baking stone. I cannot recall what steaming method I was using when I baked this bread. 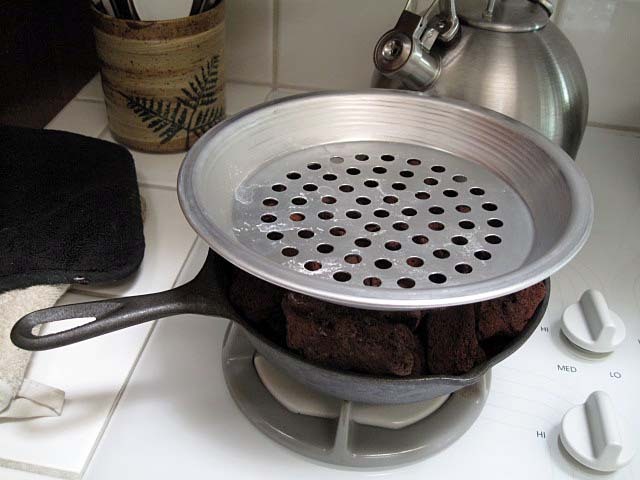 Currently, I use a 9" cast iron skillet filled with lava rocks. This is pre-heated for 45-60 minutes, along with the baking stone. The stone is on a rack in the middle of the oven. The skillet is on the lowest shelf. Right before baking, I fill a perforated pie tin with ice cubes and place it on top of the lava rocks. I generally remove the whole steaming apparatus 12-15 minutes into the bake. I don't know much about sifting WW to obtain "high extraction" flour. If you don't want to order ihigh extraction flour, I would use a mix of white and whole wheat flours. If you can order it, my favorite is the T85 replica from Central Milling. I am about 200 miles from their warehouse, so shipping is fast and not too costly. thanks David. cool method for steam. I've just been using a porcelain roasting pan with boiling water in it, but it obviously is a little weak. Does the cast iron rust or are you diligent to keep it clean? I guess any lava rock from amazon would do the trick? I just noticed that CM has 5lb bags of type 85. Didn't think I saw that when I looked years ago. I'll check out the other 2 miche. Ever done any bread with einkorn or farro piccolo ?